After returning from lunch at Yo Sushi, I have decided to do another sushi post. I did say that I would didn't I?! I'm sorry to those of you who don't like sushi but if you've never tried it you definitely should! 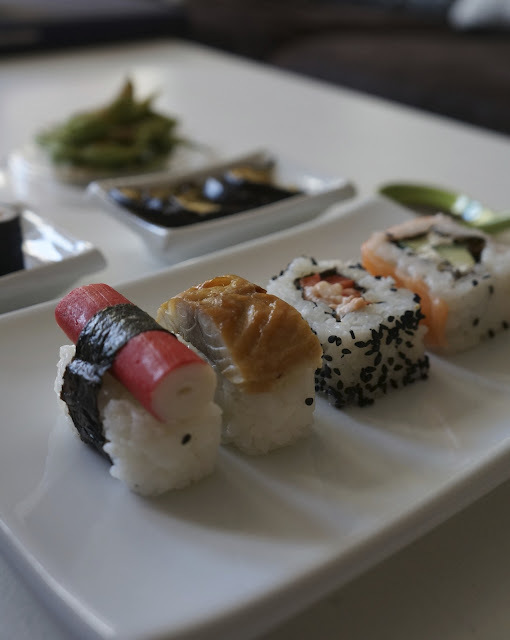 And don't let the whole raw fish thing put you off; most of the sushi I eat doesn't even contain raw fish. Also, you should try Yo sushi; I mean it's food on a conveyer belt. What's better than that?! I decided to make my own!! You should already know that I love mezes (usually of the Cypriot/ Greek variety) and I love Japanese food so I decided to combine the two; a Japanese style meze! As you can see above, I had: sushi (a crab stick nigiri, steamed fish nigiri, salmon + cucumber ISO and a prawn + pepper nigiri), grilled aubergine, beetroot + carrot maki, endamame beans and a carrot, courgette + endamame salad served with low salt soy sauce. Grate a small carrot + courgette and slice an onion as thinly as possible (I used a mandolin slicer). Mix together and top with endamame beans, sesame seeds and balsamic vinegar (if desired). A handful of steamed endamame sprinkled with chilli powder and crushed sea salt. Cut three thin slices of aubergine. Place under a preheated medium grill for 3 minutes on each side. I cheated a bit here and used pre-made sushi (from boots!) 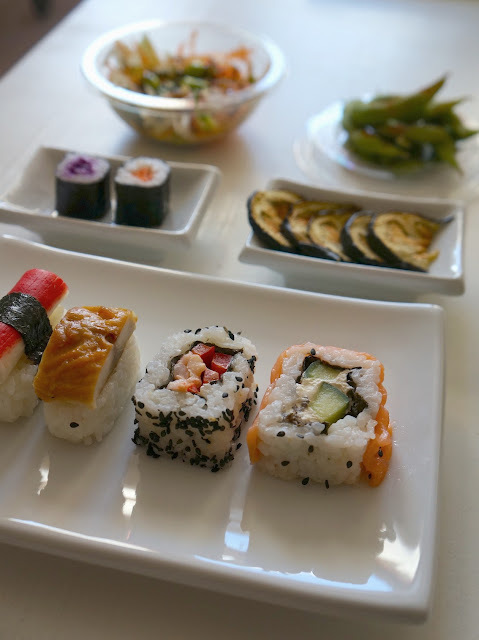 but to make your own sushi, follow my healthy low-carb sushi tutorial here. This meze was so successful that I may make it a common occurrence; perhaps a different cuisine every week! Mexican, Italian , Spanish... right enough that would be a tapas! Do you like sushi? If you have never tried it before, do you think you will now? What is your favourite cuisine? 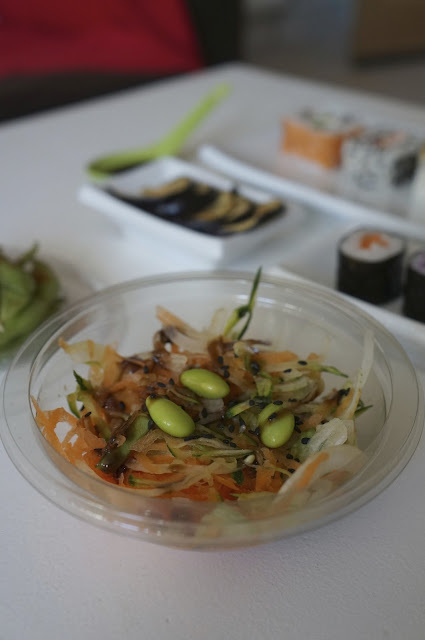 Have you ever tried Yo Sushi? Do they have these in the country you live? من اخطر الحشرات والتى يطلق عليها الارضه حيث تسكن هذه الحشرات وتستعمر اثاث المنزل والتى تكون السبب الرئيسى فى تأكل اثاث منزلك وكلما استمرت لفتره اطول داخل المنزل دون القضاء عليها تتكاثر بطريقه كبيره جدا وتقوم بعمل ممرات داخل قطع الاثاث الامر الذى يدفع اصحاب المنزل بالبحث فورا عن طرق للقضاء علىها من التكاثر وانتشارها فى المنزل ثقوم شركة مكافحة الحشرات بالدمام بعمل بعض الخلطات والمكونه من عدة مبيدات حشراية غير مضره بافراد منزلك تساعد على التخلص من يرقات النمل الابيض المسئوله عن تكاثر النمل الابيض وعدم ظهورها مره اخرى داخل منزلك وتقدم الشركة ضمانات تصل الى 15 عام لضمان عدم عودة النمل لمنزلك مره اخرى كذلك النمل الاسود والذى يوجود فى كل منازلنا لانها مأوى مناسب لتكاثر هذا النوع من الحشرات من حيث درجة الحراره كذلك المناطق التى يتم تخزين الطعام فيها .